Nusinersen (Spinraza®) is an approved drug for the treatment of 5q-associated Spinal Muscular Atrophy (SMA). Infants and children treated with Nusinersen may experience cessation of disease progression and improvement in muscle function. As of date, there are no systematic data on Nusinersen therapy in adults. To improve the data situation for adults receiving Nusinersen treatment, scientific treatment documentation is called for. The structured treatment evaluation option on the APST care portal performed by patients themselves has proven a highly effective instrument for the documentation of treatment outcomes with Nusinersen. Three self-rating therapy questionnaires for the digital capturing of treatment with Nusinersen are available on the APST platform. The documentation has been conceived as a scientific register study entitled digitNusinersen1. Participation requires to fill in the following three questionnaires (ALSFRS-ex, TSQM und MYMOP) at regular intervals. 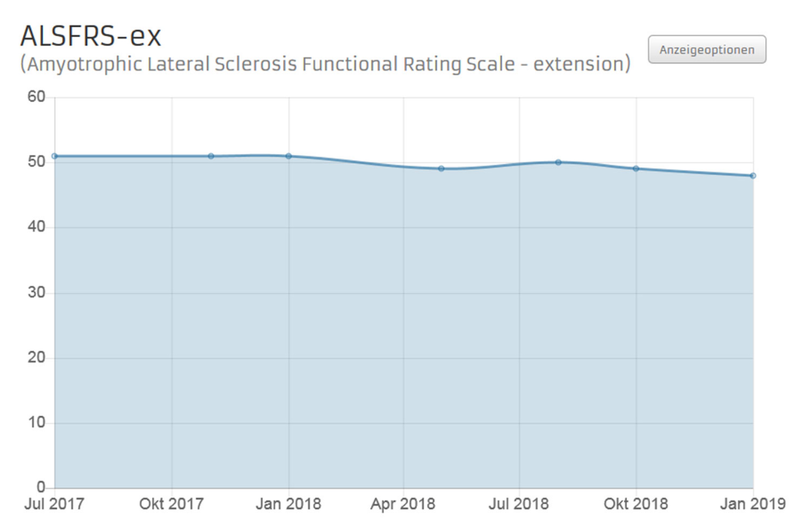 The extended ALS Functional Rating Scale (ALSFRS-ex) is an ample means of capturing the SMA disease course in individual patients. The ALSFRS-ex questionnaire records current impairments perceived by patients in performing routine key tasks as a result of SMA. ALSFRS-ex is a 15-item questionnaire on physical function (e.g., speaking, swallowing, and walking). There are 5 answer options for each item elucidating the presence and severity of impairment. Patients are required to fill in the questionnaire at regular intervals of three months during their course of treatment with Nusinersen. 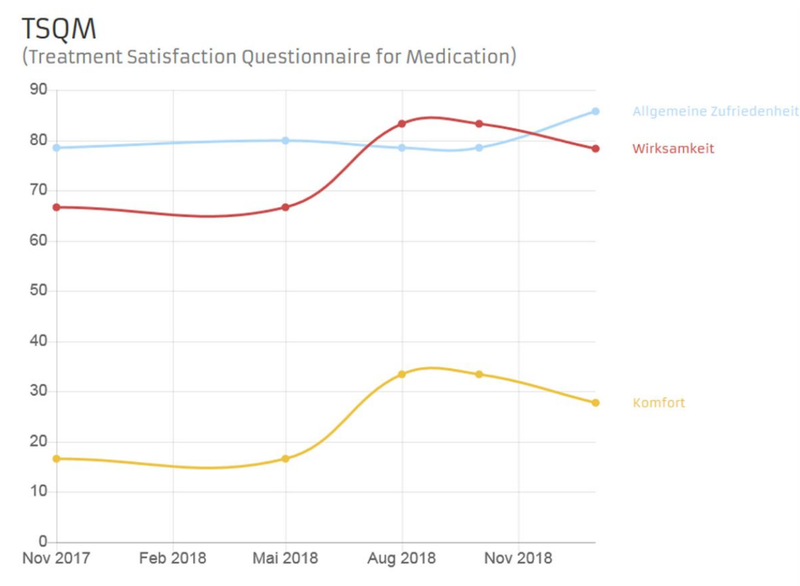 Patient satisfaction with Nusinersen therapy is captured by means of the Treatment Satisfaction Questionnaire for Medication (TSQM), a nine-item rating scale. The items on the TSQM refer to three aspects: Efficacy (questions 1 to 3), User Friendliness (questions 4 to 6) and Overall Satisfaction (questions 7 to 9). The answer options range from “highly dissatisfied” to “highly satisfied”. For each block question, an aggregate sum (from 0 to 100) is calculated and then analyzed. The higher the aggregate sum, the higher patient approval. 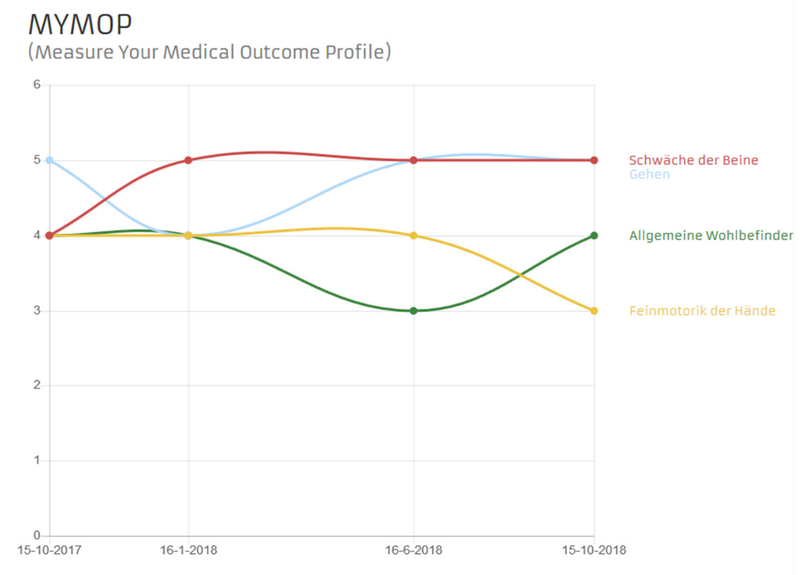 The MYMOP (Measure Yourself Medical Outcome Profile) questionnaire is an assessment instrument created by patients, i.e., it is the patients who decide individually which impairment they would like to rate. The MYMOP comprises an initial questionnaire and a questionnaire measuring symptom progression. In the initial questionnaire, patients specify the symptom that is most important to them. This symptom is entered into the questionnaire. Patients are given the option of entering a second symptom; while this makes perfect sense, it is not mandatory. In a subsequent step, patients choose a daily key activity they feel impaired in due to symptom 1 and/or 2. Symptoms and activities are rated on a scale from 0 to 6, as is the state noted for the previous week. The only new information contained in the MYMOP outcome questionnaire is a third symptom, which, again, is optional. The MYMOP is captured at regular three-month intervals. The questionnaire can either be filled in online, via the telephone or in writing. The data can be entered online by using the APST account. Alternatively, an experienced telephone interviewer may arrange appointments so that ratings can be given via the telephone. Ratings can also be given in writings at regular visits to the participating outpatient departments. The results for the three questionnaires are depicted as history charts on the APST patient accounts. Patients and their treating doctors thus benefit from a visual representation of disease progression, and ratings for patient treatment satisfaction and treatment outcomes. Such history charts can prove very useful to all the parties involved in the complex treatment with Nusinersen. Fig. 4. Navigation bar with links to the ALSFRS-ex, TSQM and MYMOP History Charts on an APST patient account.